If you don't have a CERN badge, you must have an ﻿access card﻿ to get into the small locale, which is located in building 52-S-008. The room is next to the CERN library. 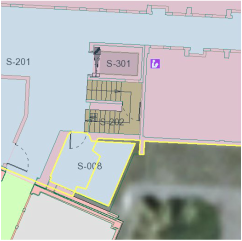 Another entry to building 52 is in the angle just across from the main building where the CERN bus stops. Once your are in the building, take the stairs on the right of the elevator and go one floor down to the basement. Room S-008 is on your left. The key is the same as for the large locale. The booking policy for the small locale is not as restricted as for the big locale, since there are fewer users. So for the small locale, it is okay to make multiple bookings per week. However, please respect other members and give everybody a chance to reserve the small locale. The small locale is equipped with an e-piano/synth, speakers, mixing board, guitar amp. It does not have microphones, a bass amp, or a drum kit because of noise restrictions (it is directly under the CERN technical library). and the other way round to turn off: first turn off the speakers, then the mixer, then the instruments (piano...) then the general switch on the multi-plug. Please switch off the equipment (in the correct order) and the electrical heater before you leave.